Apache Spark is a fast and general engine for large scale data processing. It is written in Scala, a functional programming language that runs in a JVM. It provides high-level APIs in Java, Scala, Python and R, and an optimized engine that supports general execution graphs. You can use Spark through Spark Shell for learning or data exploration (in Scala or Python, and since 1.4, in R) or through Spark Applications, for large scale data processing (mainly in Python, Scala or Java). The Spark Shell provides interactive data exploration (REPL – Read/Evaluate/Print Loop). You can start Python Shell with pyspark command and Scala Shell with spark-shell command. The fundamental unit of data in Spark are RDDs (Resilient Distributed Dataset). They are resilient because if data memory is lost, it can be recreated; they are distributed because data is stored in memory across the cluster. Initial data of dataset can come from a file or be created programmatically. Actions: An action is an operation such as count(), take(n), collect(), savesAsTextFile(filename) or first() that triggers a computations, returns a value o back to the Master or writes to a stable storage system. Transformations: A transformation is an operations such as filter(), map() or union() on a RDD that yields another RDD. They are lazily evaluated, because data in RDDs is not processed until an action operation is performed. RDD is materialized in memmory upon the first action that uses it. Transformations may be chaining together, that is, you can chain several tranformation command joining them by dots, all of them, in a unique big command. The following illustration summarizes the terminilogy of Sparks on Job executions. A job is a set of tasks executed as result of an action. A stage is a set of tasks in a job that can be executed in parallel. A task is an individual unit of work sent to one executor over a sequences of partitions. RDD operations are executed in paralell on each partition. When possible, task execute on the worker nodes where the data is in memory. Some operations, such as map, flatmap or filter, preserve partitioning and other operations repartition, such as reduce, sort or group. Narrow operations: Only one child depends on the RDD. These operations like map, filter or union, can operate on a single partition and map the data of that partition to resulting single partition. This means the task can be executed locally and we don’t have to shuffle. Wide operations: Multiple children depend on the RDD and a new stage is defined. This means we have to shuffle data unless the parents are hash-partitioned. These operations like groupByKey, distinct or join may require to map the data across the partitions in new RDD. They are considered to be more costly than narrow operations due to data shuffling. Spark SQL provides a convenient way to run interactive queries over large data sets using Spark Engine, base on a special type of RDD called SchemaRDD. SchemaRDD has been renamed to DataFrame. A DataFrame is a distributed collection of data organized into named columns; it is similar to a table in RDBMs. DataFrames can be converted to RDDs by calling the rdd method which returns the content of the DataFrame as an RDD of Rows. Data sources for DataFrames can be external databases, hive tables, existing RDDs, JSON datasets or structured data files. Spark SQL provides two types of contexts: SQLContext and HiveContext that extend SparkContext functionality. SQLContext encapsulates all relational functionality in Spark. It is a simple SQL parser. HiveContext provides a superset of the functionality provided by SQLContext. It can be used to write queries using the HiveQL parser and read data from Hive tables. You don’t need an existing Hive environment to use the HiveContext in Spark programs. 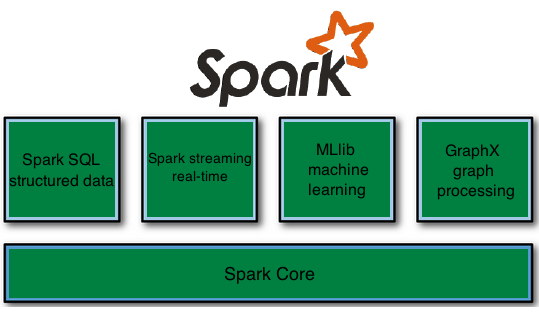 Spark streaming is an extension of core Spark that provides real-time processing of stream data. Support Sacala, Java and Python. It divides up data stream into batches of n seconds and processes each batch as an RDD. The results of RDD operations are returned in batches. Spark streaming uses DStreams, Discritized Stream. A DStream is a sequence of RDDs representing a data stream. Each RDD contains data received in a configurable interval of time. DStreams are created by StreamingContext in a similar way to how how RDDs are created by SparkContext. DStreams are defined for a given input stream, for example, Unix socket. They are also prepared out of the box for other networks sources such as Flume, Akka Actors, Twitter, Kafka, ZeroMQ, etc. and for monitoring folders and files (for example, new files in a directory). Transformations: create a new DStream from an existing one. Output operations: write data, for example to a HDFS file system, database, other applications, dashboards, and so on. They are similar to RDD actions. Machine learning aims to extract knowledge from data, relying on fundamental concepts in computer science, statistics, probability and optimization. Machine Learning refers to programs that leverage collected data to drive future program behavior. GraphX unifies optimized graph computation with Spark’s fast data parallelism and interactive abilities. GraphX unifies ETL, exploratory analysis, and iterative graph computation within a single system. You can view the same data as both graphs and collections, transform and join graphs with RDDs efficiently, and write custom iterative graph algorithms. You can use GraphX for problems on the relationships between the individual data items. For example, social networks, web page hyperlinks and roadmaps. These relationships can be represented by graphs .